Basic Personality: Korose is a very disoriented and easily agitated person. Because of his upbringing, being essentially brainwashed and tortured into the perfect assassin, he knows very little to nothing of normal life and struggles to maintain a semblance of normalcy as he tries to find a purpose in this world. He is, despite his lack of "normal" education, very smart and highly perceptive as well as a walking lie-detector. He does not forgive and forget, nor does he negotiate. He's a steadfast and powerfully determined person who will stop at nothing to achieve his goals. He is also, despite his still learning why, fiercely loyal to those who accompany him and will fight to the death to protect them as his only human connections in this world. Basic Background: At a young age, Korose was birthed to a mother who belonged to the cult worshiping the Nether Realm and who eventually began using the Siphon Magic to take the Life Energy of the Dragon Race. Korose was an attempted sacrifice to bring a servant of the Evil King to this world, but the ritual failed and the Demon's spirit and power were sealed within the boy's body. However, the side effect of the ritual, failure or otherwise, is that his eyes now glow with crimson light. Growing up within the cult, Korose was trained, tortured, and brainwashed into being the perfect killing machine so that, even if the ritual failed, he would serve the purpose of the Demon's role as a servant of the Evil King and bring an end to humanoid life in this world. However, Korose chanced to encounter someone who would change his life forever while out on a mission. Someone who showed him just how brainwashed he really was and what it meant to see other humanoids as people instead of targets and dead bodies walking. Korose broke from the cult with not a penny to his name and only the old black clothing on his back, as well as the reputation as the Red-Eyed Demon, the most dangerous assassin in the world who is both enhanced by a Demonic being's power and wields Shadowfare magic... A deadly combination no matter what race you are. Far away in the rolling green plains on the Eastern lands of Kirkalth on the far north edge of the Lonesome Sea, a dark and ominous wind was blowing in from the East... Which meant it was actually coming from the West, towards the center of the world. He'd heard the call. Felt the change of the winds. But his Shadowfare magic told him the shift was a lie. A feint. The Darkness masking its movements and trying to shift the senses of the world of mortals to remain ignorant to its true intentions. But that didn't matter now... He had work to do. Glowing crimson eyes gazed through the night towards the north end of the city of Fausen. There, in the tallest tower of the largest estate in the land, was the master bedroom of one Grand Vizier Totomeo Haakun. A vile, wicked, corrupt man whose very existence made life miserable for the people of this city, and many other cities surrounding it across the land. His influence had shifted the balance of power in this land in favor of the aristocracy, siphoning it away from the King and Queen where it truly belonged. And this was an affront he would not, and could not stand for. The glowing crimson orbs faded and blended with the darkness, the figure they belonged to becoming not but a whisper of the night. In the estate of Totomeo Haakun, life was very different from outside his "sacred" walls. Skipping briskly through his hallways, he laughed and pranced about like a child through a field of flowers. His night robe, a gleaming golden trim surrounding a beige/white core, flowed around his legs like whispy clouds. "Oh hohohohoho! Such a marvelous, glorious night, is it not?" He asked aloud to nobody in particular. Passing a maid, he smiled sweetly and caressed a lock of her hair. The gesture made her freeze in place and the color drained from her flesh as her body trembled at his touch. "Come now, Otomi... Is it not a beautiful evening?" "O-of course, sire. Beautiful indeed." She replied in a meek, quivering voice matching her body's shakes. "Ah, my dear, sweet Otomi. You don't seem to believe the words you speak." "Tonight, I shall bed you and prove to you that the night is truly beautiful. Just. Like. You." He said, kissing her cheek. As he pranced away, Otomi fell to her knees, her hands covering her groin over her dress as tears leaked furiously from her wide, panicked eyes. Continuing down the hall and up the stairs, he passed a butler. "Oh ho! Franklin! Lovely night, isn't it?" The butler bowed swiftly, a hand across his abdomen. "That it is, sire. I'm happy to see you in such high spirits." "Ah, of course! On a night like this where nothing can go wrong, what's not to be joyous about?" "Have you taken any maids yet, by chance?" "N-no, sire. I haven't. I-... I feel I am not yet ready to do so." Haakun skipped forward rapidly, closing the gap between them. His eyes glistened with the lamp light as one finger rested beneath Franklin's chin, lifting it slightly towards Haakun's face and lips. "Now, now, Franklin. In this household, the ladies are never left to fend for themselves. You must become accustomed to taking them to your bed in the evening. Only then will they attain true happiness within our sacred walls. No?" Franklin's temples dripped with sweat as he lost some of the color in his face. ""O-of course, sire. I-I sh-shall... Make a choice tonight. Yes." "B-b-but, sire! Lady Neharu is my lord's sister, is she not?" Haakun's finger slid forward to Franklin's Adam's apple, his fingernail digging into flesh as his eyes gleamed dangerously with a smile that could only belong to a Demon from Hell. "... No woman is ever left to fend for herself. Not even those in my family... Understood?" "Y-... Yes, sire. I shall visit Lady Neharu... Promptly." The smile became joyous once again. "Excellent! Please, see to all of her needs and bring her the greatest joy and pleasure you can! If not, I shall knooooowwww!" Skipping happily away, Franklin leaned against the wall in a cold sweat, adjusting his collar and tie to let him get some air flow through his formal attire. Arriving in his bedroom, Haakun beheld four gorgeous women waiting for him. All were stark naked, on all fours on his bed, facing away from him while looking back over their shoulders. He could see everything, and his smile widened considerably as he flicked a lock of his long, luscious hair back over his shoulder and approached slowly. "Sorry my darlings. I didn't mean to keep you waiting... Are you ready for me?" His eyes trailed them over, observing faces and... Lips. Moistened and primed, he approached the blonde on the far left and observed how she gently rocked her hips back and forth for his viewing pleasure. And when ready, Haakun lay a single hand on the small of her back. The mere sensation of his hand against her flesh made her shudder and her blood run cold. Tears stung her tightly shut eyes as she felt it begin. Her nightmare. Gently rocking forward and back she gripped the sheets as the others watched in horror while trying to make it look like they were eagerly awaiting their turns. "Now, now, my darlings. Be joyous this beautiful night! It-... Aaahh~... It shall all come to a glorious conclusion before our time is up!" He stated as he began to intensify his performance. The sound of the bed groaning and creaking as it rocked back and forth filled the room. He moved from girl to girl, one after the other, back and forth to experience them all at his leisure. Each turned away to cry when it was their turn, and quickly dried their tears to look his way when he moved on. If they looked at him with tears in their eyes... A gathering of skeletal remains of women of various races beneath the estate's dungeon in a pit awaited them. Finally, he reached the culmination of his performance and held fast to the blonde on the left as he felt himself lose a few fractions of a pound. Pulling back he observed her calmly and with a sickening smile, licking his lips as he saw the fruits of his "labor" appear from her. She quivered intensely and dipped her head, the others breathing a sigh of relief that it was not them who experienced his finish. "Thank you, my beautiful darlings. You may go now." All four women got of the bed, bowed, and left the room slowly and silently. But in the halls a fair distance away from the room, the blonde broke down in uncontrollable tears scratching at her womanhood as if it would remove from her body what he had done. The others knelt down, tears dripping from their faces as they tried desperately to comfort her. But nothing could. With that monster's seed sewn, in time she may find an unhappy surprise growing within her as many women often did so long as they lived here. Haakun laid down on his bed, exposed and still excited, as he breathed in a deep, fulfilling breath of fresh air mixed with the scent of women. "Such a beautiful night where nothing could possibly go wrong." He whispered to himself. Slowly, his excitement began to fade. And as it did he rose to his feet to douse the lamps. One. Two. Three. Two lamps left. He approached the fourth lamp and blew it out, and as he did he looked up at the glass window and saw a pair of gleaming crimson orbs staring back at him. He jumped back in horror for a second, but the orbs were gone in an instant. He looked outside at the sheer drop to the ground over one hundred feet below and shook his head. "Surely a trick of the night... Yes." He closed and locked the window, only to experience a small gust of wind behind him as the final lamp was extinguished on the other side of the room. "If this is some kind of joke!" He said, marching to the middle of the room. Slowly, he looked up and spied a mass of shadowy tendrils gathered in the ceiling. At their center was a solid orb of darkness, and from the center of the orb stared two glowing red eyes like none he'd ever seen before... But which he knew by reputation all too well. "Y-y-... You!" He cried as he stumbled back. The mass remained still, save the whipping shadowy tendrils, and the eyes widened with dilating pupils as he trembled in fear. "It has to be you... 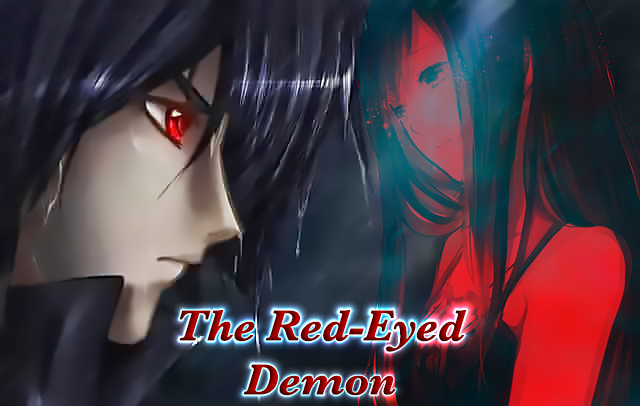 The Red-Eyed Demon!" The mass dropped from the ceiling and landed before him. As he tried to scoot back the tendrils wrapped around behind him entrapping him in its cold, slithering embrace. He was pushed towards the eyes, shaking and crying every inch of the way trying desperately to free himself from the darkness. But it was no use. He was finally pushed directly before the eyes, and his breath caught in his throat. "... Perish." Came a deep, demonic, double-toned voice. Haakun was suddenly overcome by shadows and his screams muffled before suddenly cutting off. When the darkness retreated, only an emaciated corpse was left in its wake and sent sprawling to the floor below. The shadows retreated out one of the nearby windows... And were gone. The next morning, the corpse was discovered and reported to authorities. His body was cremated, and given a burial fit for a noble of the highest order. A blessing he didn't deserve, but one his fortune afforded him. The one who stole his life, the Red-Eyed Demon, had completed his contract. And now, it was time to investigate what was going on in the center of the world... In Dragon's Cove. The winds softly caressing the land whispered unto the ear of the world a foul and vile secret. The weight pushed down against each blade of grass, flattening them ever so slightly out of their natural alignment. And upon those blades of grass crashed a heavy, thundering boot of raven black leather. Sliding up to black pants, loosely fit to the frame of the wearer, to a belt with a silver buckle, and a hide leather jacket atop a black under tunic with a small 'V' cut collar. Finally to a pair of simmering crimson eyes aglow with the light of the Wicked. "I feel you." He whispered. His fists clenched, stretching the leather of his black gloves forcing a groan from them as his knuckles went white beneath them. The very air practically crackled with an overflowing source of mana which was rapidly drawing closer. All the years of meditation and honing his skills had taught him to read the world's mana and sense its natural ebbs and flows like the waves of the ocean. And ahead, towards a city on the coast, was a horrible imbalance. And not only that, but now that he looked closer, there were the first signs of a massive fire bursting out on the Eas-No, the Wes-No, the entire city! "What in the name of-"
Wasting no time, the Red-Eyed Demon disappeared into the darkness of his Shadowfare magic and raced towards the now rapidly burning city. To describe the event as a nightmare was an understatement. Even for Korose who had seen and done horrible things throughout his long life as an assassin, this was something altogether different. A beast drawn straight from legends, a Dragon, was now on the rampage. Its ebon wings had to be at least one hundred feet from wingtip to wingtip, with a body of even greater length. The crest upon its head sported seven spiked scaly protrusions like fire around its crown. And those ominous, almost dead eyes cut through the very souls of all who made eye contact. Not knowing what to do to stop the creature, Korose had little time before ducking for cover during a strafing run of its powerful flame breath. Barely avoiding the assault, he beheld his jacket, partially charred at the end, before looking back to the Dragon as it resumed its assault. Dashing through the alleyways, Korose noticed that storm clouds were gathering which was excellent. Soon, the world would be cast in shadows. His home. His world. With a smile slowly spreading across his lips, he dove for a nearby bridge to hide beneath it and channel his mana as he prepared to engage the Dragon with his Shadowfare magic. Within minutes, the skies were completely covered. Thunder roared and lightning flashed as rain began to bathe the land beneath. The charred, flaming city became an ocean of steam and ever changing air currents thanks to the Dragon's effect on the air around it as it flew. With its fire breath mixing and clashing against naturally cold storm currents, miniature tornadoes were formed in its wake with each attack run. But at last, the sun was blocked completely. And from beneath the bridge erupted a tower of dark energy with a pair of gleaming red eyes at its core. The Dragon, being too large and far away to see the eyes, only saw the tower of darkness and charged at it. Deftly from within the core of the tower, Korose sunk beneath the Dragon letting it fly straight through. The darkness tugged at the Dragon's body throwing its flight pattern off slightly, but otherwise leaving it without a scratch. Damn. I thought that would hurt it at least a little. The Dragon circled back once more, attempting to chomp and tail swipe the Darkness into submission. But to no avail. At least, not immediately. But on its fourth run, it managed a lucky blow and knocked Korose out of his tower and hurtling towards the ground. But before becoming a red smear, he managed to activate his magic to save himself at the last second. However, doing so came at a cost. His left arm grazed the ground tearing away the jacket and tunic sleeves and shredding his flesh before he managed to right himself and escape certain death. Coming to his feet, he looked at his now horrifically bleeding and skin-shed arm before seeing the Dragon about to attack once again. The beast was almost on top of him, but a dash to the side saw him observe, almost in slow motion, the massive teeth slamming into the Earth beside him kicking up dust and concrete and knocking him away from the force of the wind its wings created. To make matters worse, one of the miniature tornadoes had picked up debris from a crumbling building nearby and sent several shards of glass screaming through the air before impacting his body across his chest and waist. Four shards in all, each buried about two inches into his flesh. 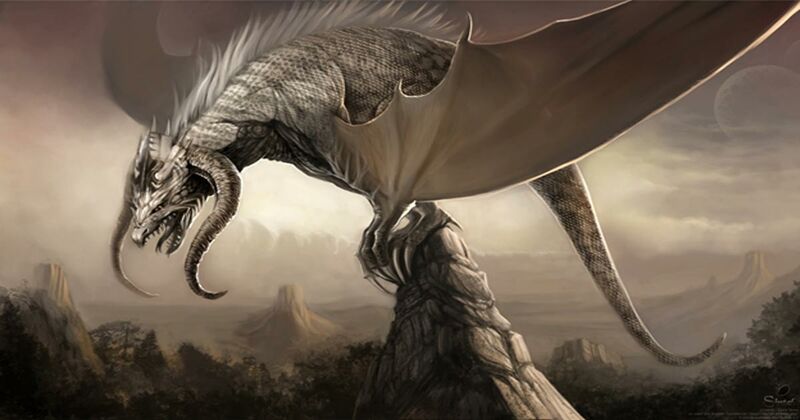 Grunting and growling in pain, he kept his eyes on the Dragon as it circled around for another run. And so, carefully removing the glass from his body, he stood against the Dragon's assault. The beast flew down, and he used the Darkness to blind it with a protective wall before shooting himself to the side as it passed. But the tip of its wing struck his stomach sending him flying through a nearby window into a general goods store and crashing through several shelves and stands of items and goods. Now buried beneath a heap of debris, he barely managed to lift one of them off his chest before gasping for breath with a small spurt of blood coming up with it. Looking down, a thin piece of wood protruded from his lower left stomach and a crimson liquid all too familiar to him dripped to the debris and floor below. The roof of the building was torn free, and the Dragon gazed angrily inside at the tiny mortal who'd pestered it with a snarl. And in that moment, Korose's mind began to wander somewhere it never had before. I never did believe in the Gods. But if you're real and listening... I'd rather not meet you just yet. Suddenly, the world went quiet and time stood still. Korose looked left, then right. Everything was in a haze. Everything moving at a fraction of its normal speed. The Dragon's gaping maw bearing down on him, he could see down its throat and count each stain on its otherwise white teeth. Wayward son of the Earth and Trees. Vessel to the Wicked. Receive now my power, and let begone the Darkness before you! Through the haze, a beam of light only he could see crashed down onto him. Flooding him with energy and vitality, Korose erupted from the debris in a massive whirlwind of dark magic which sent the Dragon sprawling onto its back and its head bouncing off the ground twice cracking two of its horns. The beast roared in rage and pain, looking up to see the towering maelstrom of black magic swirling before it as Korose's red eyes glowed furiously within. The Dragon quickly wriggled onto its stomach and turned to face him, but this time things were different. The moment it lunged to bite into the darkness it was repelled and bio-electricity sparked between them searing its scales. This was followed by a massive spiked flare of darkness aimed at the creature. It broke upon contact with its body, but the impact force sent it to its side on the ground and skidding for several dozen feet. Another flare, another several dozen feet. And another. And another. Finally, the maelstrom of darkness all came crashing down on the Dragon's body consuming it entirely as it shrieked in fear and agony. But at last, the Dragon broke free. Flying into the air, its body now sporting numerous missing patches of scales and dripping blood, flew off into the distance as the darkness came under control. Korose touched down and crashed to his knees. Sil'Eph Niir, the Dragon Goddess, calls to you from Dragon's Cove! Hurry my child! Time is of the essence! "Yeah... I kind of figured that out, thanks." Just then, a little girl no more than three years of age approached the wounded Korose as he fought to keep himself upright. "Mister... Have you seen my mommy?" She asked. She was holding tightly to a doll hand-stitched, likely by her mother, and her eyes glossy and out of focus. Looking up behind the girl, he noticed a pair of female legs protruding from beneath a crushed building, and the girl's footsteps leading away from them in the mud to where she stood now. Reaching out to put a hand on her head, Korose offered his best smile. "She's... Sleeping. But she'll... She'll be back." He said quietly. Korose then collapsed, and the world faded to nothing.